Thank you for choosing Wilson Medical Center (WMC) for your upcoming procedure. No matter how extensive your procedure, we know surgery is a significant event for anyone, and we want to assure you that your team of providers will care for you at all times. In addition to improving your health in the safest of environments, our goal is to ensure that your surgical experience at WMC is a positive one. We encourage open communication with our patients, so if you have questions or feedback that would improve your experience with us, please let us know! Wilson Medical Center Surgical Services offers a variety of same-day surgery and inpatient surgical procedures. Our compassionate care team uses advanced surgical technology to help you heal appropriately and return to normal activity. As a community hospital, we provide a high level of care and attention to each patient. We know surgery can be a scary experience so we focus on keeping you informed and involved in every stage of your care. We listen and respond to your questions and needs with compassion and respect. Patients are confident in a modern and sterile environment that enhances safety and recovery. 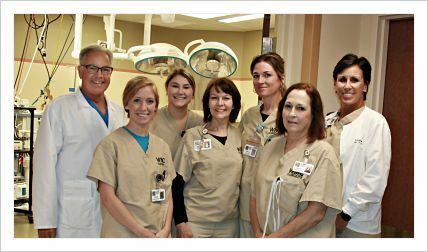 The personal touch our surgical staff gives sets the patient at ease and assures them and their family that they are in caring, competent hands. We provide a variety of surgical services from minor to major; including Endoscopies (Colonoscopy & Gastroscopy), Laparoscopic, General Surgery, Podiatry, and Pacemaker Implantation. Providing these surgical services close to home alleviates the stress of travel, accommodation arrangements, and unfamiliar surroundings. In addition to our skilled surgeon, Charles VanHouden, MD, and qualified surgical team, we also have local physicians who provide a wide range of surgeries. Contact your physician or hospital surgical department for surgical services. An experienced RN (Registered Nurse) oversees patient care in our Recovery Suite until the patient is stable enough to either be discharged or be admitted to acute care. If you are an area business, please inquire about the occupational services we provide, from rehabilitative physical therapy to carpal tunnel surgeries.